Deal 1 damage to a minion. If that kills it, draw a card. If your spells look like horrifying skulls, let's be honest, you should get to draw some cards. 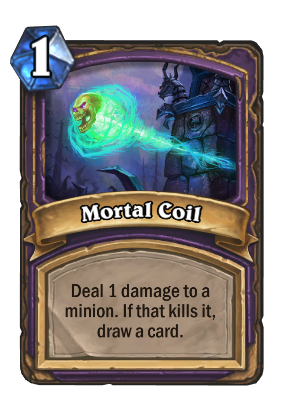 One of the more overlooked powerful class cards IMO, warlock would be a lot worse without this card, with no way to finish off 1 health minions. One of the only warlock spells that is as powerful as spells from other classes.